Lighted Home Address Plaque - - Two light bulb styles available: standard 3-watt incandescent bulbs or brighter, energy-efficient LEDs that use less power than incandescent bulbs. Our lighted address plaques are visible at over 100 feet away, making it easy for guests, delivery trucks, and emergency vehicles to find your home. 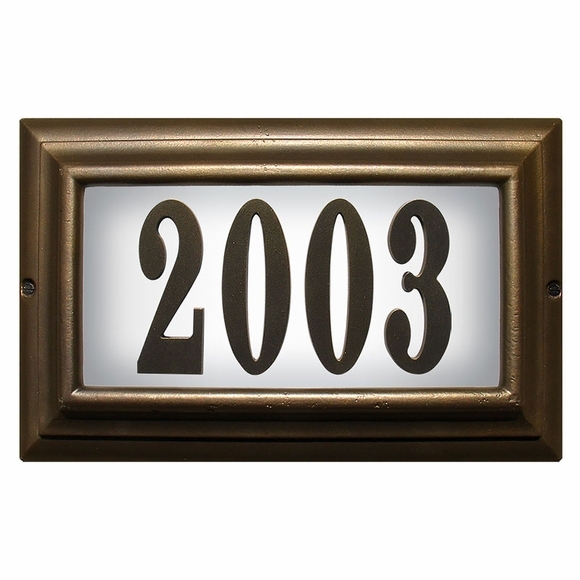 This stylish surface mounted home address sign features durable cast aluminum construction that won't rust, rot, or crack, ensuring years of quality use. Attaches to an existing low-voltage doorbell transformer. If you are hanging this address plaque in a spot without access to a transformer, you will need to purchase and install either a plug-in or hard-wire transformer (sold separately; item 67029F, see Related Products). Available in five finish options (French bronze, oil rub bronze, antique copper, black, and pewter). Holds up to five 3" vinyl numbers. Dimensions (approximate): 7.5"W x 2.5"D x 13.5"L.
Made to order. Please allow 2 to 3 weeks for delivery. Beautiful and rich add on to my home. Can be seen clearly from the street. I have received several compliments. This is a very nice product and quality made. I looked around a lot before purchasing, including local hardware stores. NO ONE had a product of this quality. I am very satisfied with it.